My Seasonal Advertisers list of Events the rest of the year and a shout out to them! Each Advertiser I mention has their own special events that draws in more customers and they do a great job at that too. Here is a list of of events for each for the rest of the 2017 season. Each has created their own niche and customer base and with everything else they have done a great job with that. 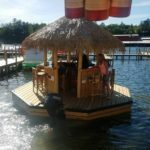 Paradise Beach Club is a beach themed Bar in the Weirs Beach that hosts gigs that draws in traffic every Friday and Saturday. Much of it is modeled after the famed Key West Florida, in fact much of the staff loves to visit there. A very popular one is Tigerlilly. They do have a cover for bands. They have VIP Tables and seats and that can be used for Bachelorette parties. It draws in many people who love to go boating. They have an outdoor patio. They serve awesome Prime Rib. They draw in tons of business during Bike week and host events for it every day during it. I enjoy going there to watch the bands and meet up with friends. In addition I enjoy promoting their events and love being an asset to the owners business. The owners are Brett and Krista Loring. They are great and kind people. The bartenders are friendly and serve fast. They are open from first weekend of May to Saturday before Halloween or Halloween Saturday if Halloween falls on Saturday. I get really sad when it’s closed for the season! In addition, I have made many friends here. October 28 Annual Halloween Costume Party and Fighting Friday! after that see Ya 2018 Season! Now a Shout out to the Tower Hill Tavern. They have an upstairs and downstairs. The Upstairs is Bigger. Both are for music and where the bartenders serve. They too are fast, smiley and friendly! They have new gigs every Friday and Sat. They have a stand where they serve pizza. 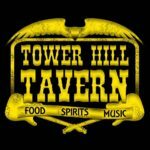 The Tower hill Tavern is open EVERY DAY in the summer and has a great menu! One of my best friends who goes here a lot loves the food here. They host events every day during Bike Week and it fills up. In addition they sell tank tops, t shirts and sweatshirts (Hoodies) upstairs, prices are as shown in one of the pics. Come and get your Tower Hill Tavern Merchandise! Anthony is the owner and has done a great job, as have the hard working bartenders and bouncers. In addition, pics of the menu are shown below. Every Friday is Dancing night! NEXT IS that AWESOME Beach Bar the NASWA. the Naswa is an amazing place and has been around since 1935 but opened as a resort first. It hosts a resort where guests can stay and rooms are right near the beach. 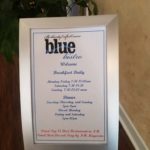 There is a Breakfast place called the Blue Bistro that opened in 2012. They have merchandise of the place right in the front lobby (as shown in pics below) , so come and get your Naswa gear! They have a beach bar right along the sand and lake called the NazBar that opened in the early 1980s. They have a menu where they serve great food, tropical drinks and martinis and drinks! 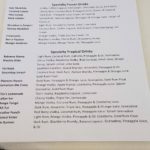 The drink and food specials change every day. A pic shows a sample. its Margaritta Mondays they have, Taco Tuesday, Whiskey Wensday and Half off Burger & Brew Night Thursdays. 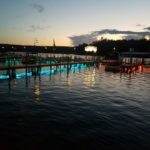 The water can light up color at night (As shown in one of my pics). 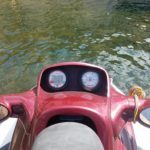 Many boaters and Jetskiers like me can ride around there and dock our boat to get a nice drink, get our toes in the sand and or meet up with friends. It can get busy. A lot of friends and or couples and families come together to enjoy this atmosphere. The friendly and smiley bartenders and waitresses work hard to. They host many events that attract customers at the Nazbar. For Example Every August they host 80s weekend and the staff there dresses up 80s style as do guests. In addition they have gigs on the weekends. For Bike Week it gets filled. They hold Bikini Contests there. 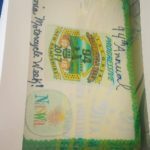 They held Bike Weeks 94th Anniversary there during Bike week and there was a Cake Cutting Ceremony. Why as a matter of fact the Naswa was named the Hotel of Bike Week. 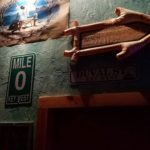 Its a great spot for Bike week fun too! The Naswa sponsors many places & even worked the Radio Station arond Bike week. In addition, They had the Peter Makris Walk Run. Cindy Makris is the owner and she has done a good job as has Kara Chase who is in charge of the Marketing. I am glad to advertise with the Naswa and I learned of many events in the process that I in the end liked and those events grew on me, all the more to be thankful! They are open from Memorial Day weekend to Columbus Day Weekend. Here is events for the rest of the season.